All asbestos surveys carried out by ACM Management Solutions Ltd are conducted in accordance with our Quality Management System, which is certified and being compliant with ISO9001:2008 and subject to annual audit by UKAS accredited Quality Assurance Body: TUV UK Ltd.
Extensive systems, procedures & protocols are maintained to ensure that we provide a consistently high quality service, which meets our clients’ needs in full and complies with all relevant industry standards. We have held QA certification to ISO9001 standards since 2004 and internal audits are conducted continuously to ensure that we are maintaining these standards. ACM Management Solutions Ltd is a privately owned limited company, totally independent of any other organisation. The Company and its employees maintain impartiality & integrity in all their activities, ensuring the content and recommendations contained within survey reports and any consultation provided are both technically correct and free from outside influence or bias. 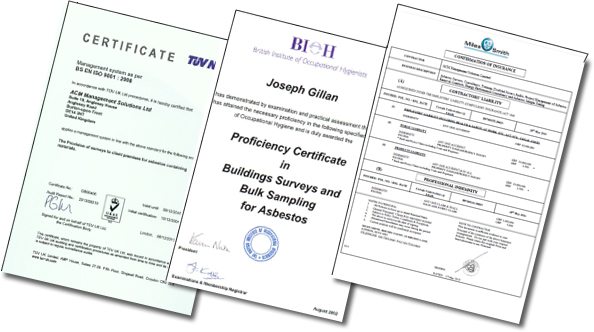 Our asbestos surveyors have at least three years experience in asbestos surveying and the minimum standard for training is BIOH P402 – ‘Building Surveys and Bulk Sampling for Asbestos (Including Risk Assessment and Risk Management)’, in accordance with HSE document HSG264 & UKAS Guidance RG8. Through our membership of ARCA (Asbestos Removal Contractors Association) we maintain full awareness of current Asbestos Regulations & HSE guidance and as a result of regular refresher training we ensure that our methods & survey reports are all in accordance with current best practice. As we often work in schools, hospitals and other environments where children or vulnerable adults may be present we ensure that appropriate back-ground checks are carried out on our site personnel and CRB Disclosures are obtained.